As you read this story, a French show promoter is biting his fingers and regretting. 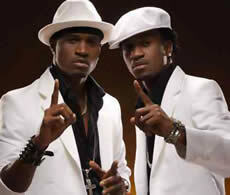 Reason, he was swindled off $100, 000 USD (N15 million) by a fake P-Square’s manager. According to sources, the road to ‘magahood’ began late last year when the French promoter, eager to bring the singing sensation to France had gone to, of all places, Facebook and Twitter to launch a search for P-Square. His search led him to phony Facebook and Twitter IDs purportedly belonging to the manager of the twins in France. Sources say the ID belonged to an Igbo guy, who claimed he had acquired the franchise to manage P-Square in France for two years. While we are not sure whether it was ‘juju’ or sheer brain he used, what we are sure of is that the Frenchman, believing he was talking with the right person transferred a whopping $100, 000 USD into the account of the fake P-Square’s manager. However, it soon dawned on him that he had been swindled after the fake P-Square’s manager stopped taking his calls and so he raised the alarm but it was too late, the account into which the money was wired had been cleaned out and the fake manager had popped into the blue. Reacting to the story, an ex-PMAN president, who did not want his name in print, had lamented thus: “This is tragic! The fault lies with the artistes who wouldn’t join a union. If there is a real union, things like this would not happen because the union would be the first port of call for any show promoter from any part of the world wanting to do business with Nigerian artistes. Meanwhile, we hear that the French show promoter is leaving no stone unturned in fishing out the culprit and is currently making efforts to reach out to security agencies in the country.